If you’re living with Diabetes, you may be wondering what foods are best for me? There are many more foods a person with diabetes can enjoy than they otherwise might think…especially Superfoods! Here is a list of Superfoods to start incorporating into your diet today! Beans: Rich in fiber and a good source of magnesium and potassium. You can’t go wrong with beans; they are also a good source of protein! Fish: protein powerhouse and source of anti-inflammatory Omega-3 fatty acids. Cinnamon: Rich in chromium, a mineral that enhances the effects of insulin. Several studies have shown that this tasty spice may help reduce blood sugar. In a large nonstick pan, heat the oil over medium heat. Add the garlic and sauté for 30 seconds. Add the spinach and sauté for 3 to 4 minutes. Add the sweet potato, cumin, black pepper, and water to the pan. Sauté for 2 minutes. Cover, reduce the heat to low, and cook for 8 minutes. Add the chicken to the pan and mix to incorporate. Sauté for 2 minutes. 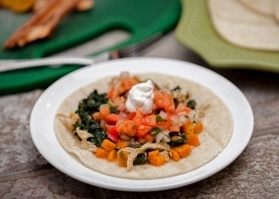 Fill each tortilla with 1/4 of the chicken and sweet potato mixure. Top with 2 tsp of sour cream and 2 Tbsp of pico de gallo. Dietitian’s Tip: For the chicken, use leftover cooked chicken or purchase a cooked, rotisserie chicken. Pico de gallo, a fresh salsa, is found in most grocery stores in the refrigerated area of the deli or produce section and adds a lot of flavor and crunch to this recipe.